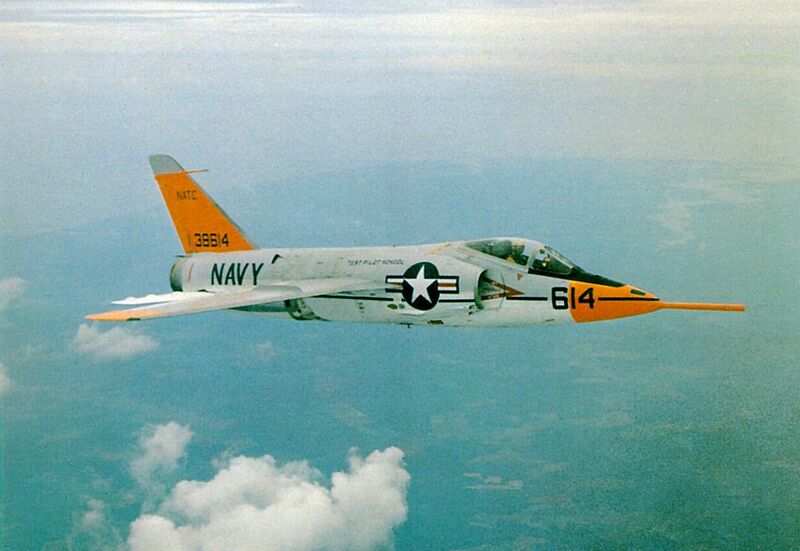 The origins of the F11F Tiger (redesignated F-11 in 1962) can be traced to a 1952 Grumman effort to modernize the company’s F9F-6/7 Cougar. Yet, in final form the aircraft departed sharply from its predecessor. Designed as a lightweight fighter, the development model of the F11F, first flown in July 1954, featured thin swept wings, incorporating spoilers instead of ailerons, coupled with an area-rule (coke-bottle shaped) fuselage design that enabled it to exceed Mach 1. 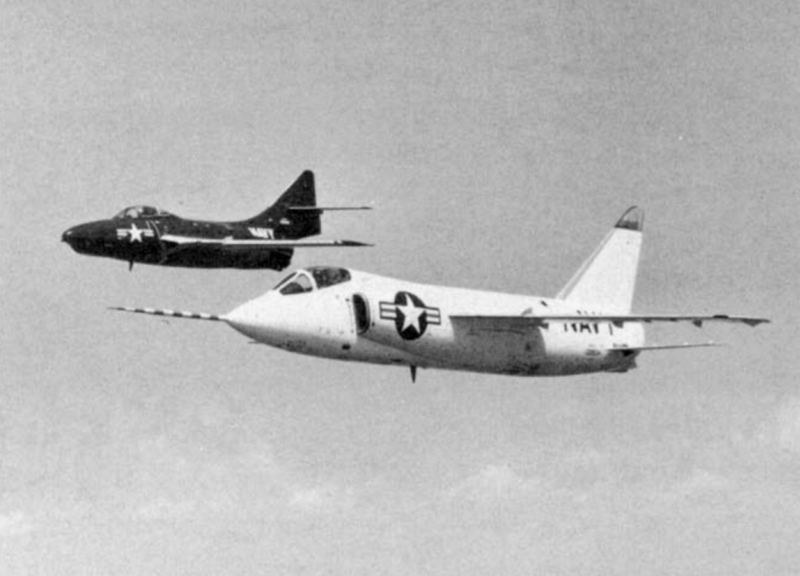 The F11F-1 test trials produced one of the most bizarre flights in aviation history when a Grumman test pilot managed to “shoot himself down” with his own bullets. As JP Santiago explains in an interesting article appeared on his website Tails Through Time, part of the flight test program to get the Tiger operational involved clearing the performance envelope for the firing of its four 20-millimeter Colt cannons which were mounted under and aft of the air intakes. As the Tiger was designed to be as light as possible so to attain the highest performance with its Wright J65 Javelin engine (which was a license-built version of the British Sapphire engine), the expended cases and links from the Colt cannons were ejected overboard rather than be retained onboard the aircraft. During the cannon firing portion of the flight test program, it was immediately found that the airflow patterns around the aircraft allowed the spent cases and links to hug the fuselage, causing multiple dents and scratches. At one point in the program the Tiger test aircraft had to be fitted with an armored leading edge to the horizontal stabilizer as the damage from the links in particular could be significant. The solution was to change the ejection mechanism and associated chutes so that the shells were forcibly ejected out longer chutes that projected out into the airstream and away from the turbulent air along the sides of the Tiger. A complex internal mechanism recycled the links to a special compartment just ahead of the cannon ammunition boxes as the links tended to cause more surface damage than the spent casings. 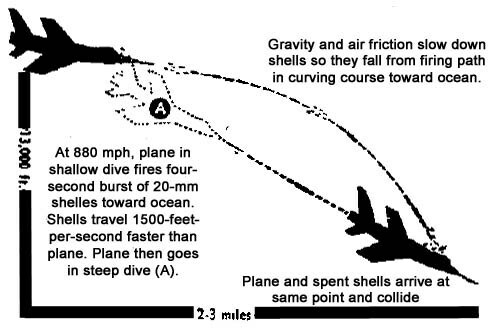 Graphic on how F11F-1 test pilot shot himself down. On Sep. 21, 1956, Grumman test pilot Tom Attridge sortied out of the company airfield at Calverton, Long Island in aircraft BuNo 138620 to conduct high speed firing tests of the cannons. It was the 41st flight for this particular F11F-1 Tiger and it was Attridge’s second test flight of the day. As explained by Robert Munro in Aero Album, Spring 1968, Volume One, his flight profile for this test was to start out at 22,000 feet and accelerate in afterburner at a 20 degree angle past Mach 1. Passing through 13,000 feet he would fire a four second burst of the cannon, wait three seconds to allow the guns to cool, and then fire a second burst, ending the profile at 7,000 feet when the ammunition load would be expended. Attridge flew the prescribed profile and upon expending the ammunition, was suddenly confronted by the shattering of the forward armored windscreen caused by some sort of object. He immediately throttle back and pulled up to reduce speed to prevent the windscreen from caving in and at 13,000 and 200 KIAS he turned back towards Calverton. The only damage he could ascertain was a gash to the right intake lip and that every time he took the engine up above 78% power, it began to run rough. Two miles from the end of the Calverton runway and at 1,200 feet with his wheels down and flaps lowered, Attridge found that 78% engine power was insufficient to maintain his glide path as the sink rate began to increase. He advanced to full throttle only to be greeted by what he described as “the engine sounded as if it was tearing up” and he immediately lost power. Three-quarters of a mile short of the runway, the Tiger settled into the trees and the aircraft traveled for 300 feet before coming to a stop. Though the aircraft was on fire, Attridge managed to escape quickly without injury and the Grumman crash crew and rescue helicopter were on scene in less than three minutes. Eleven minutes after landing, the company helicopter landed a local hospital to have Attridge evaluated. Examination of the aircraft showed it had been hit by at least three 20-millimeter rounds- one in the windshield, one in the right intake lip and one in the nose cone. In addition, projectile fragments were found in the first compressor stage of the engine along with fan blade damage- engineers suspected that perhaps the round that hit the right intake ricocheted into the engine. It was determined that Attridge had inadvertently shot himself down. At the first cannon burst, he was in 0.5G supersonic descent and had actually flown underneath the trajectory of the cannon projectiles from the first cannon burst. Eleven second later, as he began to pull out of the descent, he flew into the stream of projectiles from the first burst. Subsequent examination of the aircraft showed that Attridge had flown the same test profile earlier that day and what was thought to be large ding from an ejected casing on the vertical fin actually turned out to be a projectile hit- apparently Attridge had grazed himself on the first test flight of the day and gotten away with not shooting himself down!